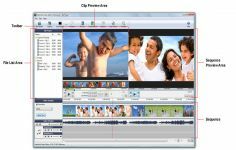 VideoPad Video Editor is a powerful audio application for editing video from any camcorder, DV camcorder, VHS or webcam. VideoPad Video Editor is a powerful specialized software for video editing that allows you to transform your favorite personal movies into professional-quality videos, providing a complete set of tools to obtain rendering quality. The application allows you to import your files from camcorder, VHS player or a webcam and mix it the way you want by simply "dragging and dropping" the timeline window. You have the possibility to delete unnecessary passages, add music tracks, make your own narrations and enhance your movie with a multitude of effects like transitions, trimming and fade effects. Once your project is complete, you can share it with a few clicks by burning it to DVD, posting it on popular video websites or by registering on the medium of your choice: PC, PSP, iPod, iPhone or 3GP mobile phone. This software has an option that allows you to export the final rendering in a wide range of media formats. VideoPad Video Editor is compatible with most current video formats: AVI, WMV, ASF, MPG, MPEG, MPE, VOB, MOV, 3GP, MP4, M4V, FLV, MKV, having no trouble capturing video from your camera, a DV camera, webcam or other apparatus to record video as well as videos you have downloaded from the Internet. Curently we don't have any log information about VideoPad Video Editor version 7.04 for PC Windows. We will this change log update soon!